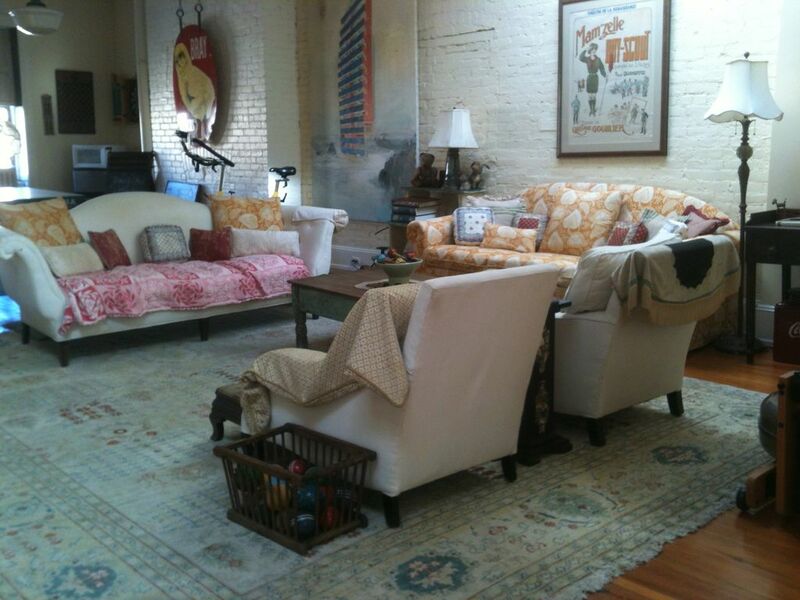 Huge,1250 sq ft, sunny loft on a quiet tree lined street. Sleeps up to 4...double bed, queen sleep sofa...but works as a totally a cozy romantic setting for 2. Beautifully decorated with art & antiques. Top of the line exercise equipment...stationary bike, rowing machine, free weights and a ping pong table. Close to transportation, 1 block from B, C, 2 & 3 trains. Bus stop on the corner. 20 minutes to midtown by train. Close to all Harlem attractions...down the block from the Abyssinian Baptist Church, near The Apollo Theater, Studio Museum, Red Rooster restaurant, Shrine music venue and much, much more. Please let us know if there is anything we can do to help make your stay comfortable and enjoyable. Please note that you walk thru our foyer and staircase then up 2 flights to get to the top floor, which is very private & all yours, but does not have a door. It is not a separate apartment but rather the entire top floor of our house. My partner Marsha and I are both native New Yorkers who spent many years travelling the world. Marsha is an attorney and I am a part time mortgage banker and entrepreneur. Absolutely AMAZING New York experience!!! This gorgeous brownstone was better than we could’ve even imagined!! We loved it so much we didn’t want to leave!! The whole experience of staying with Sandi and Marsha was just perfect, they went above and beyond any expectations we could’ve had! They were so accommodating to us from the second we booked with them. We had our two teenage boys with us and they took extra special care to make sure that we had a great time and if we asked them advice on restaurants or places to see, before we knew it they had printed up a list of directions and information for us! They greeted us as we would leave in the morning and help us with any questions and as we came home at night making sure we got home safely, we felt like they were dear friends of ours and that we were their houseguests instead of customers! The neighborhood was amazing and quiet, we woke up every morning to birds chirping out our window and the sun shining through the skylights, and it was just dreamy!! We always felt safe walking from the subway to the brownstone and it was just a couple short blocks from the subway . Sandi and Marsha thought of everything, they would leave the most amazing pastries and breakfast items, freshly squeezed orange juice and hard boiled eggs for us every night for the next morning that was so wonderful to wake up to a breakfast and to not have to rush out and buy something! We can’t say enough about this place, we are just dying to come back now!! It is exactly as the other reviews say, it’s the only way to do New York!!! An authentic amazing experience!!! Location was super convenient. Subway was a very short walk, and we could get anywhere from there. The neighborhood is beautiful and felt immediately like home- even though this is not at all like our own neighborhood. It was nice to be away from the noise and frenetic energy of downtown. The 3rd floor space is magnificent. Decorated with vintage items, it created a sense of history. Lots of homey touches we don't usually see in a VRBO space made it fun to come back to each night. The hosts are incredible and provided baked goods for each day of our stay. This allowed the morning to occur at our pace (and probably saved us a fortune by avoiding breakfast out). It was a new experience to have the hosts in residence. There is a shared access, so many days we were sent off with a "have a good day" and were welcomed back with a warm "welcome back, how was the day? " this was friendly and not at all intrusive. I love a hot soak after a long day of walking, so the jacuzzi was a highlight for me. My daughter, more inclined to shower, was less enthralled and missed a "real" shower, so that's really a matter of preference. Finally, just be aware that there is not actually a kitchen. There is a fridge (stocked with juice, milk, water and various condiments etc - a not at all usual occurrence for vrbo), a hot plate, microwave, coffee pot. You can only use one at a time, so this is not too conducive to making a full meal. This was not really an issue as we did not usually come in before dinner anyway. It is just good to know going in. You also wash your dishes in the bathroom sink. Again, not an actual problem, though possibly a bit of an issue if you are cooking "in" a lot. Warm, welcoming, spacious, charming, haven after a day of busy city activities! Sandy and Marsha were delightful hosts. The loft was so spacious and such charming decor. Thank you for the unexpected snacks and breakfast fare. The location was perfect for exploring Harlem and being able to get around on the subway with a station just a couple of blocks away. I can’t imagine staying anywhere else when visiting NYC! This loft is very cool. It’s the top floor of a fabulously vintage row house in Harlem. So comfortable. Such a great location. Sandy and Marsha are lovely and made us feel so welcome. They even surprised my daughter with a small cake for her birthday and left us pastries for breakfast every day. The giant tub is divine after a long day of walking around the city! You’d be hard pressed to find another property with as much space as this for such a great rate! It’s only a couple blocks from the subway too, so it’s very convenient for getting around the whole area. I highly recommend it! We found the loft to be really spacious and bright - easily big enough for us - 3 adults. An added bonus was the Jacuzzi in the bathroom. It was about a 5 minute walk to the subway, which meant we could get downtown very easily. Sandy and Marsha were wonderful hosts, leaving out daily breakfast treats. Sandy knew all about the area and how to get around - very helpful. Thanks!